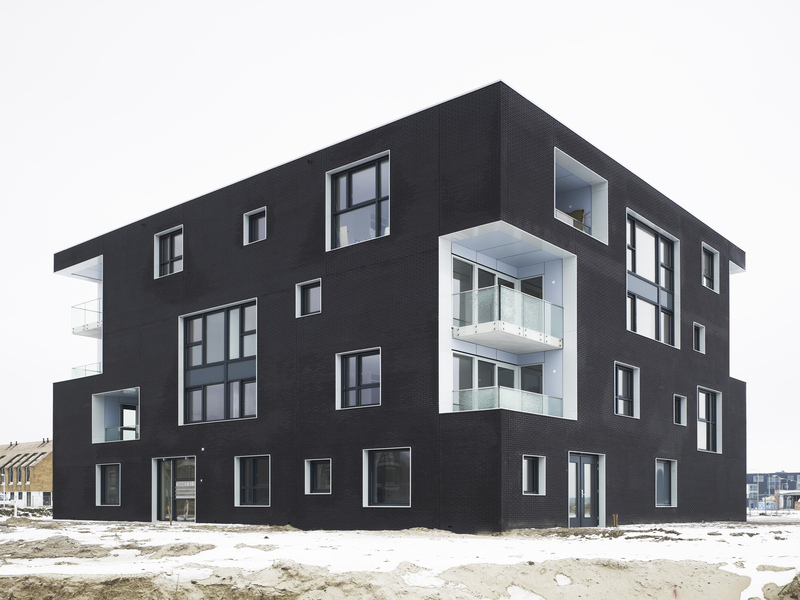 The project “Black & White Twins” experiments with the spatial and visual integration of compact collective housing solutions in the new exclusive urban development of Blaricummermeent, which is mainly formed by single-family houses and villas. 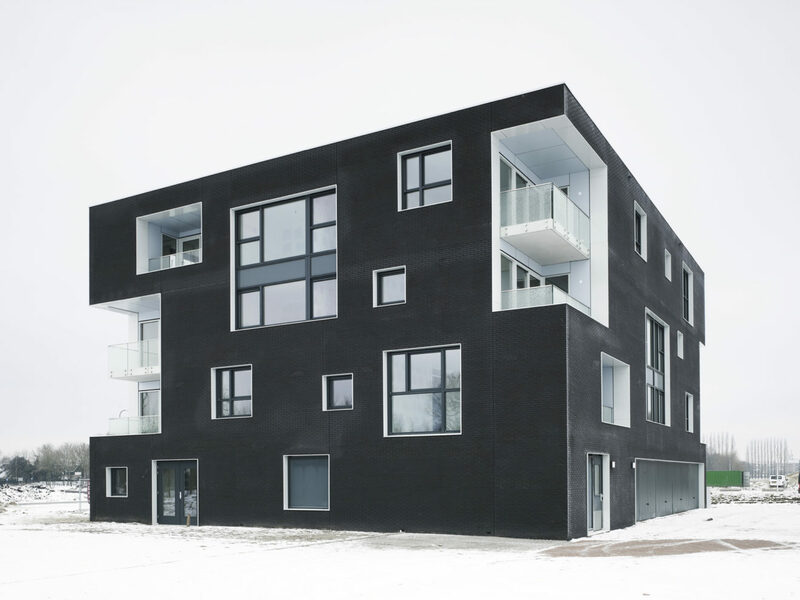 The twin buildings provide affordable apartments within small-scale housing blocks, four levels high, minimizing the footprint of the intervention, the volume of the buildings and therefore their physical impact in the residential area. 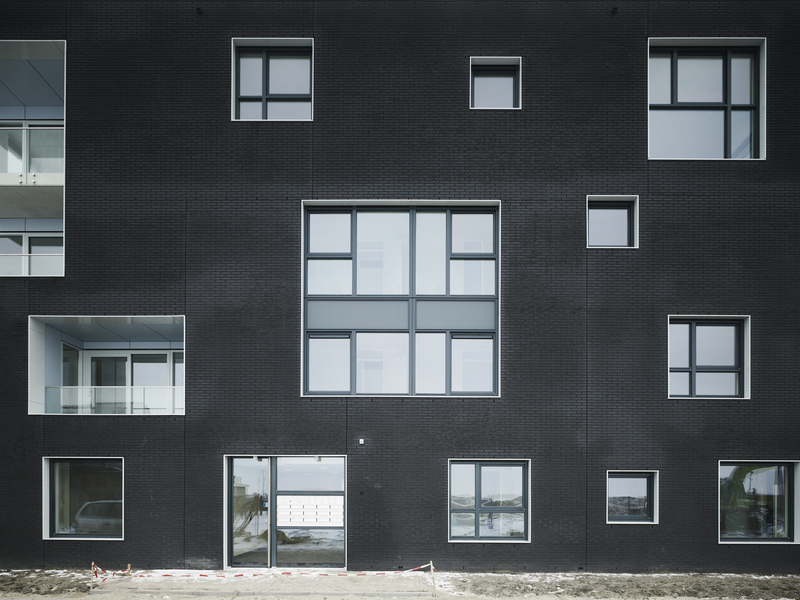 The twin apartment blocks are conceptually divided into two parts: an outer black skin perforated with windows and voids that wrap the inner part of the building and the open air spaces coloured in white. 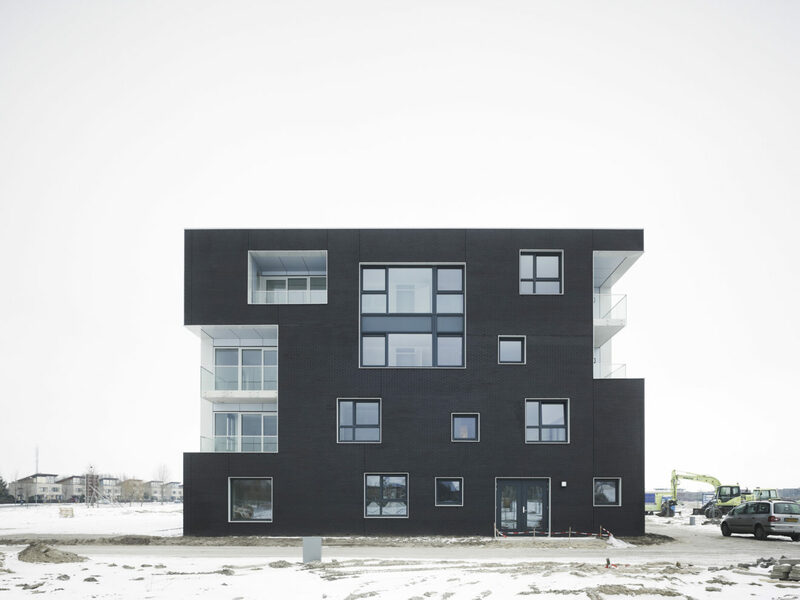 The chromatic contrast between the two parts emphasizes the conceptual autonomy of the skin of the building, which from outside works as the architectural device in charge of integrating visually the building in the scale of its urban context and from inside works as an interface that frames in different ways the exterior views creating differentiation among the apartments. The project experiments with the variety of dimensions of the voids of the façade to minimize the visual impact of the buildings and to help them to be integrated into the domestic scale of their surroundings. Extra-large windows created by the integration of four different windows within a single frame are combined with small, medium and large windows. Large voids located on the corners of the buildings combine two balconies placed on top of each other to create a single visual element. Minimizing the amount of openings in the façade and dematerializing the corners of the building with double-height voids, allows perceiving the building as a smaller object, comparable to the low-rise buildings of the context. The playful rhythm formed by the apparently random positioning of the voids in the façade has been created by alternating different floor plans within the building. Every floor plan is unique and, although the apartments share common principles, they present differences in terms of size and organization of the living spaces to promote the typological diversity. 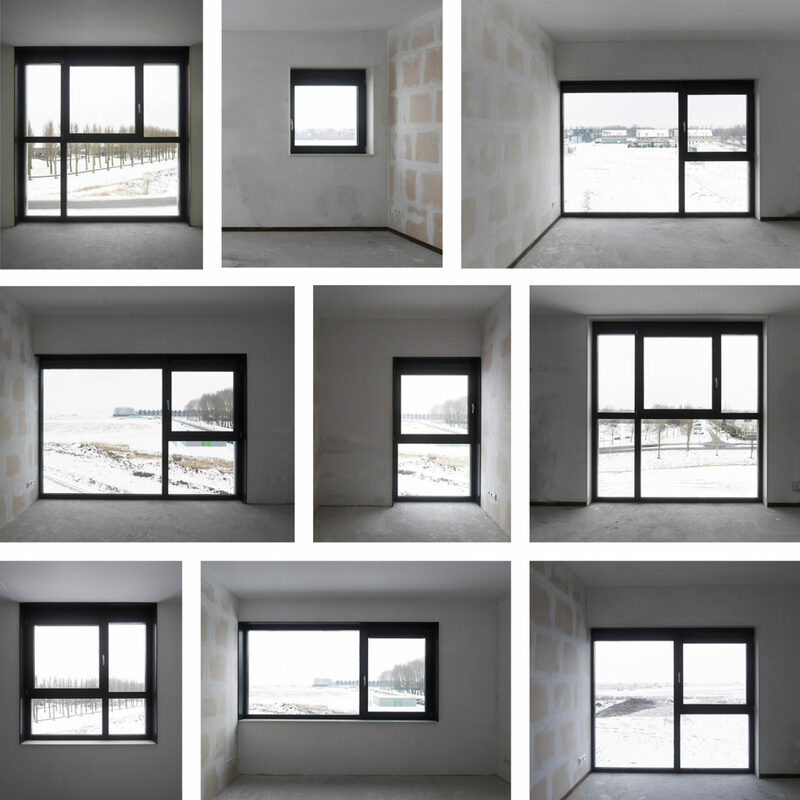 The different size of windows and the variety of their relative positions inside the rooms produce a large diversity of interior spaces, making it impossible to find two identical apartments within the building. Difference and repetition are interlinked within a single entity, creating an environment related to the human scale which, at the same time, is based on geometrical principles and on an abstract image. 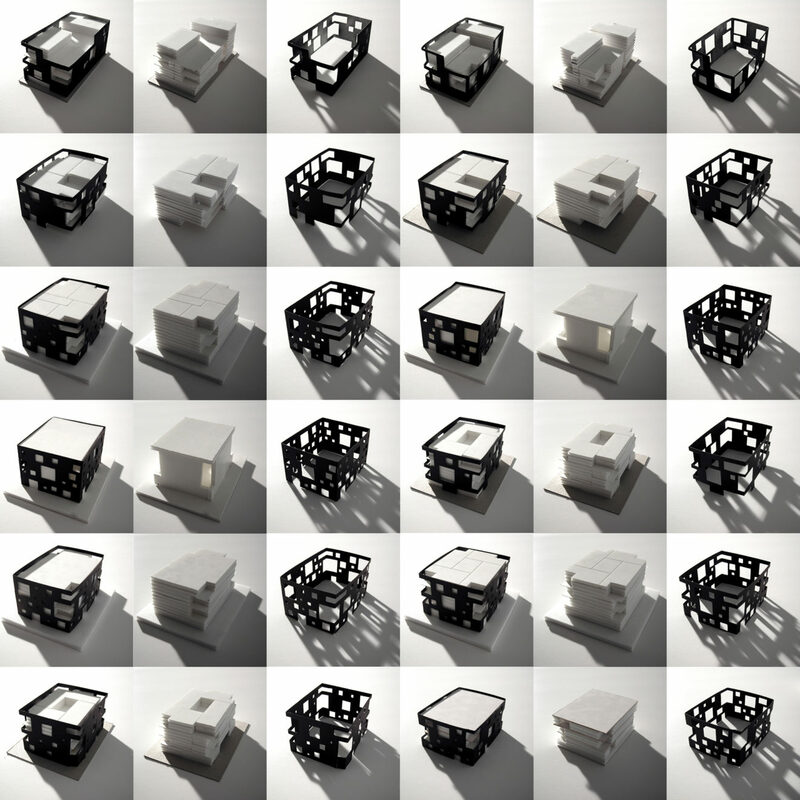 The twin blocks share the same volume, same structural principles and same materialization, but they differ in the façade composition responding to different number of apartments: 14 selling apartments in one of them and 15 renting apartments in the other. The apparently random disposition of windows and voids in the façade generates as well a wide diversity of spatial situations inside the dwellings. The different size of windows and their different positioning within the rooms characterize each interior space with its own identity. The special design of the voids strengthens the relation between each interior and the surroundings by framing the views and filtering the natural light in a particular way. Each apartment contains a balcony, which works as an extension of the living room. The balconies are located in between the outer skin of the building and its inner space becoming an “in between space” that relates the interior of the apartments to the green areas.